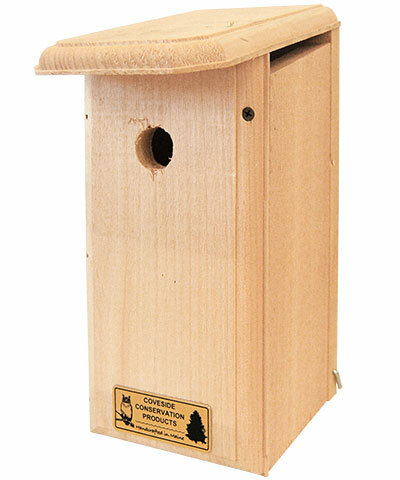 Bring friendly, musical, acrobatic chickadees to your yard with the Coveside Conservation Products Chickadee House. These little birds stay active, hopping around on trees while they forage for insects. Usually, chickadees excavate a hole from a rotten tree and build their nests inside. That's why Coveside has included a bonus bag of wood shavings with this house. Place some wood chips inside, and the chickadees think they've come across a rotting tree. Thinking that this simulated hole in the tree is an appropriate location, they then work in pairs to carry away the sawdust and build their nest. Other features also make this house a suitable location for chickadee nesting: slanting roof and drainage holes keep the nest dry, ventilation slots regulate the temperature to keep baby birds from dying in the heat, the rough interior helps fledglings climb out when it's time to practice flying, and the house is deep so that predators can't easily enter. One of the sides of the house tilts open for easy cleaning once chickadees have moved on. Mount this house to a post or a tree high up in your yard for best results. Made in the USA.